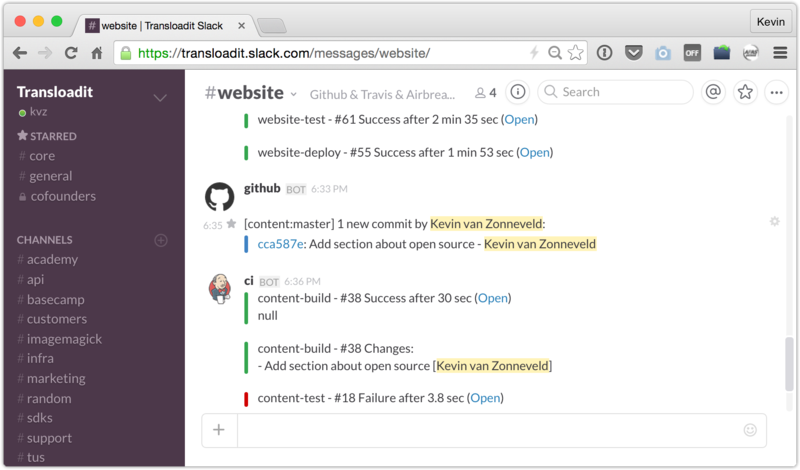 I was writing internal documentation on how I set up automated language checking at Transloadit. Halfway through, I figured this could be useful to the rest of the world as well, so I rewrote it in a more generic fashion. I will attempt to first give a high-level overview of the problem, before driving all the way down to the low-level nuts and bolts of solving it. I hope you'll enjoy, here goes! At Transloadit, we have been extracting all significantly sized chunks of text (documentation, blog posts, static pages) into a separate content repository. Up until this migration, our text was scattered across MySQL tables, templates, and HTML files. A big soup of content, layout, code, and locations. Developers were able to access all of it - but without much joy. Non-developers didn't stand a chance. We thought it would be interesting to see whether we could attract technical writers and give them full access to our content. We imagined they would be able to use the GitHub web interface in wiki-like fashion, so they could improve our language without being distracted by code, accidentally changing it, or needing much skill in that area. 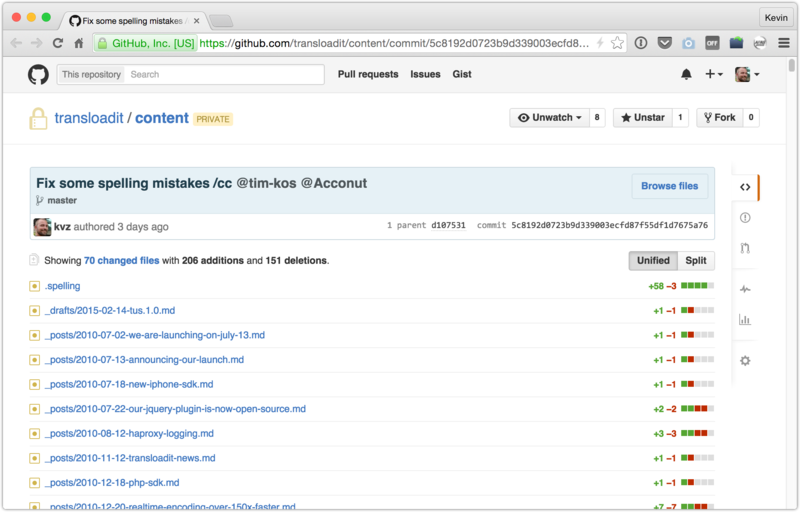 Continuous Integration (CI) is a development practice that requires developers to integrate code into a shared repository several times a day. Each check-in is then verified by an automated build, allowing teams to detect problems early. At Transloadit, we were already using this for all of our code. But could we also use this for our English? This question was especially relevant to us, because, while the majority of our customers lives in the United States, Transloadit is Berlin-based, and nobody on our current team is a native English speaker. Considering how damaging language errors can be when people are still in the early stages of evaluating a product - having some extra checks in place is all the more important to us. Odds are none of us intends to exclude or hurt fellow members of the community, but polarizing and gender-favoring language has a way of slipping into what we write. Sometimes it’s a big help to have a second set of eyes that can look things over, notice what we’ve overlooked, and nudge us towards being more considerate and inclusive. Alex helps "catch insensitive, inconsiderate writing" by identifying possibly offensive language and suggesting helpful alternatives. Alex isn’t as smart as a human, but it tries its best and is sometimes overly happy to let you know something may be insensitive. That way, we get to see the language that alex thinks could be improved, but we won't make those suggestions critical. We are currently rewriting our docs to be more inclusive, thanks to this project. offers a good separation between a document's structure, and its layout. We can specify that something is emphasized, but not Comic Sans. Those decisions are left to the designers. Often, there are multiple ways to achieve the same goal in Markdown. As with code, it helps to settle on a convention, and force every contributor to follow it. By taking away some of this (useless) artistic freedom, the resulting document looks well maintained, and invites further contribution. We were impressed by how much mdast was able to fix. Make sure, however that your files are committed to Git before running this command. You will want to review the changes made, and revert them if needed. It will most likely take a few iterations to get this into a good place. William Dutton, director of the Oxford Internet Institute at Oxford University, says in Spelling mistakes 'cost millions' in lost online sales that in some informal parts of the internet, such as Facebook, there is greater tolerance towards spelling and grammar. However, there are other aspects, such as a home page or commercial offering that are not among friends and which raise concerns over trust and credibility. In these instances, a misspelt word could be a killer issue. You had me at 'concerns'. Let's get to work. 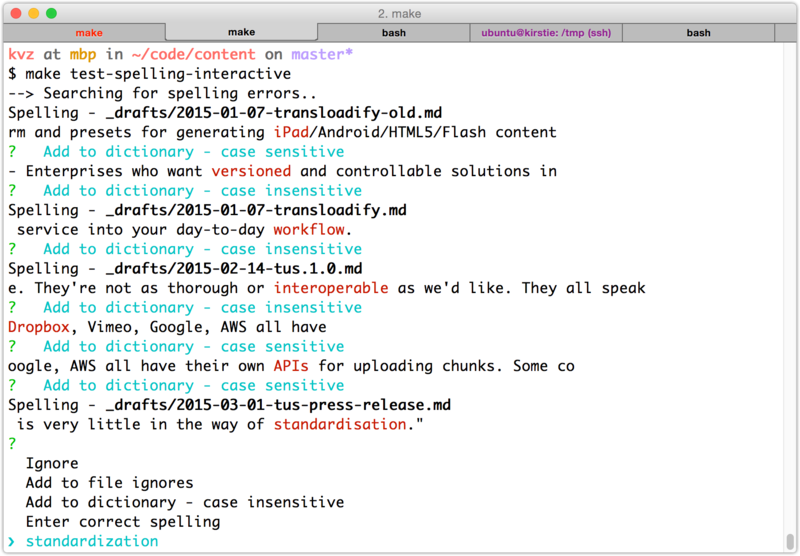 For spell checking in Markdown documents, we are using npm install --save markdown-spellcheck. This might return that "editted" is not a word. There is a good chance the first run uncovers many issues, both with your documents and with the dictionary. It is therefore a good idea to run mdspell without the --report flag so it will enter the default interactive mode. This will allow you to exclude certain files and build a personalized dictionary inside .spelling. This will probably take a while, but it could make for a great activity when you want to be productive on an otherwise uninspired afternoon. As you add new content, you will sometimes have to add words to the whitelist as well. But at least you will know that all cases where words stray from the dictionary, will be deliberate. And that's a good feeling. Now let's put this all together. Since we installed all these tools from npm, it might make sense to use npm run scripts. However, in our case, I chose a Makefile, simply because we like TABing through shell autocompletion and so that we can have the same developer entry point in all of our projects, whether written in Node.js, Bash, or Go. @echo "--> Fixing Messy Formatting.."
@echo "--> Searching for Inconsiderate Writing (non-fatal).."
@echo "--> Searching for Spelling Errors.."
@echo "--> Searching for Messy Formatting.."
@echo "All okay : )"
Now we can run make test to see if all our checks pass. We can run make test-spelling to only zoom in on spelling mistakes, or make test-spelling-interactive if we want to enter interactive mode after writing content with a lot of new words that are unlikely to be in the dictionary already. If you have Bash Completion, just type make, press TAB, and see all the available shortcuts. 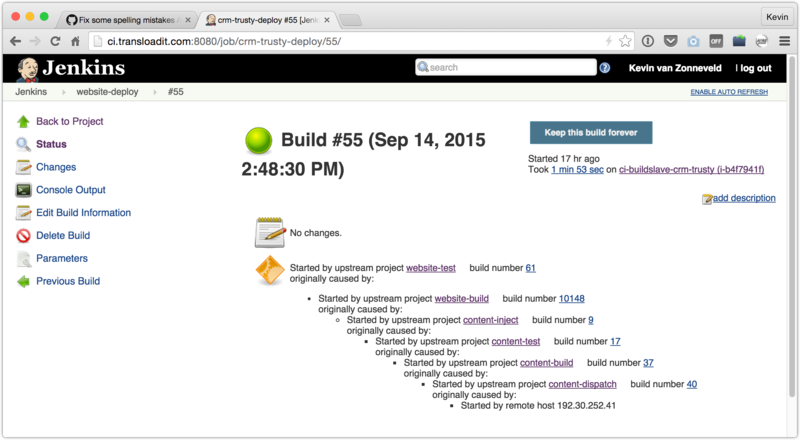 To automate testing, we will require a Continuous Integration server. Travis CI, Strider, and Drone.io, all fit the bill. As long as we have a central place that will execute code in a reliable and repeatable fashion whenever a change to your repository is made. content-inject stores the HTML into our website, then triggers: website-build, website-test, website-deploy. A chain we had already set up to deploy our website. New content can now only be injected and deployed if all checks pass. It is a pretty long chain, but luckily a machine takes care of that. And when that machine detects typos in new content, we have a Slack integration set up so we get notified immediately. No. Humans are fallible and so are their machines and dictionaries. We will need to keep tweaking .spelling, and "it" needs to keep correcting me. But with this automated quality control for language, we keep each other in check, and have less errors than before. Yes.. it turns out we are were really bad spellers! If you know of other cool Markdown processing tools to add to our build chain, let us know on Twitter or comment on HN. Finally, we are still looking for a good technical writer to help us improve our language, as computers can only get us so far. Remember that you would only be working on Markdown files, the rest is taken care of automatically. Mail us if you are interested!